These days, unique wedding guest book ideas abound. Brides and grooms are choosing a variety of unusual options for recording the names of their wedding guests. The designs shown here are a little more traditional but also allow for customization. Is your wedding theme classic, vintage, country or retro? Are your colors black and white, blue and gold, mint and peach? The materials and embellishments used to create your guest book will be the elements that make it shine with your theme and colors, and be unique to you. Contact Me to begin designing your wedding or bridal shower guest book. Cover Size: 9" x 5 3/4"
This style of guest book is based on a traditional format of blank pages where your guests can sign their names. 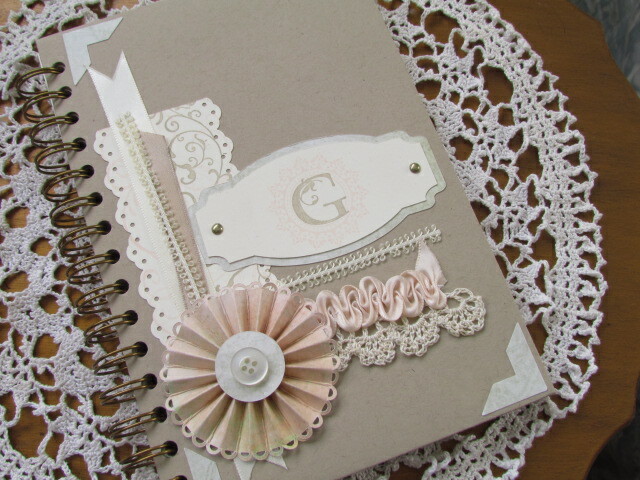 The little twists that make this wire bound guest book different are the scrapbook and stamped elements used to dress it up. The wire binding allows pages to lie flat for ease of writing and each page is embellished with stamping that sets it apart from plain and functional and gives room for guests to include a little personal note when they sign.